Furry friend or vermin? The line is blurry at this Vancouver-based wildlife rehabilitation nonprofit. Barney, Marsden's resident flying squirrel. After Jackie Marsden took in Penny, a young tree squirrel with persistent eye infections, a vet had to to remove the animal’s eyes. Later, Marsden watched as Penny herself removed the eyes of every stuffed animal she was given. In Marsden’s view, however, if the state succeeded in eliminating invasive prey species, native predators like owls and weasels would suffer from a lack of food. 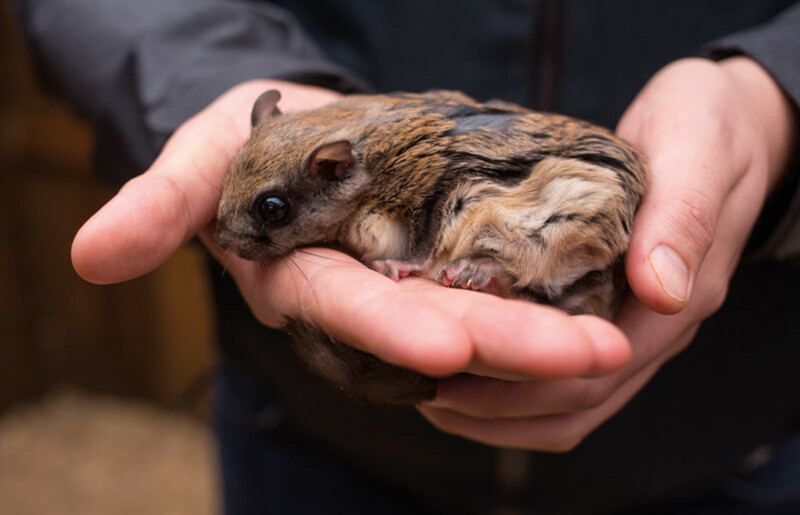 Squirrel Refuge, Marsden’s five-year-old nonprofit, operates out of Vancouver, where state law allows licensed wildlife rehabilitators who partner with a dedicated vet to care for nonnative animals. Marsden says she gets up to 12 calls a day from people who can’t bring themselves to comply with Oregon’s law. Squirrels in captivity can live up to 20 years, but 75 percent of those in the wild never reach 1 year of age, and only 1 percent will reach 5 years. Most of the 300 squirrels per year that come to Squirrel Refuge are orphaned babies, not injured adults, who join a roiling, snuggling pile of other babies. After they regain their strength and are socialized with older squirrels, Marsden releases them. Animals that cannot survive in the wild again can stay as permanent residents: there’s Penny, and Barney, a maimed flying squirrel whom Marsden says was “raised in a woman’s cleavage,” and Cedric, a playful ground squirrel raised in a frat house.